If you are looking for a scooter that a toddler can actually ride without worrying about sharp turns, then look no further than the Maxi Kick Scooter from Micro LTD. The Mini Kick comes from the company that invented the modern kids kick scooter back around the turn of the century (seriously, it was the turn of the century in the late 1990s. Might as well start referring to it as such!) and have since come up with a bunch of different improvements to provide a sort of “next generation” scooter for kids and adults alike. The Mini Kick features a lightweight but very heavy duty plastic construction on the kickboard and light aluminum for the steering post. It’s standout feature though it the smooth steering ability that allows even 2 and 3 year olds to drive this scooter without veering way off course or locking the front wheel sideways since the wheels only turn while leaning rather than turning the stick. 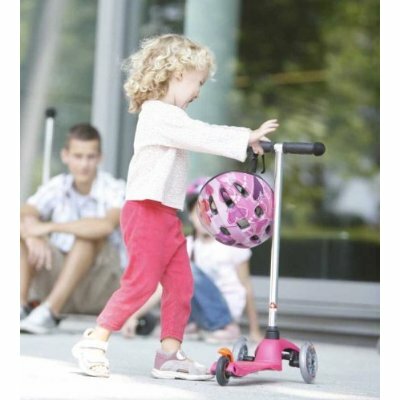 This lets young kids hold on for balance without having to worry about sending the scooter completely off course. There are lots of big kid scooters out there, and a more limited number of toddler aged scooters and the Mini Kick is certainly your top choice. Click here to see more details about the Mini Kick, including color choices.